Grand Dunes is a project of GDC Development Inc. and its president is Paul Freeman. A well-known, long-time local developer and homeowner, Freeman is responsible for such distinctive area properties including the Hidden Dunes Community, Grand Villas, Grand Harbor and now Grand Dunes. His attention to detail combined with his knowledge of what a discriminating owner expects have made these developments great successes for homeowners and investors. Freeman credits his success over the past 10 years to his gifted architect, George Rees of Rees Design Associates. “With our combined talents, George being extremely creative and I as a master critic, owners will be able to count on Grand Dunes distinction of having every feature imaginable to create the premier resort home,” Freeman said. To truly appreciate all that Grand Dunes has to offer, you should compare the difference to any other luxury resort offering in the Northwest Florida area. “ We did and found that this community will stand alone as our designs start from the inside out by providing you with the most open and spacious floor plan possible. 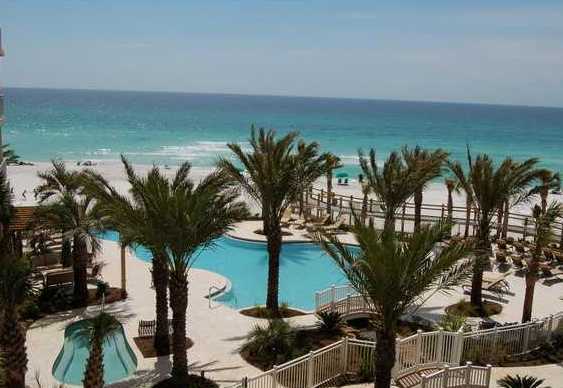 Combine this with the beautiful view you will have of the clear emerald waters of the gulf and the lush landscaping you will see as you stroll the grounds of the Grand Dunes community and Grand Dunes will be unmatched by any other property on the Emerald Coast. A few of the many features that make Grand Dunes standout from your typical “shotgun” condominium include: high-speed elevators opening directly into your own private foyer, secured underground parking, expansive great rooms with 9 1/2 ft. to 19 1/2 ft. ceilings, two bedrooms offering views of the Gulf, and our exclusive room size (11 ft. deep) wrap around tiled balcony with a built-in gas stainless steel grill providing dramatic open-air living and dining. For the gourmet cook, open elegant kitchens with oversized granite islands created by award winning certified kitchen designer, Jere Bowden feature travertine floors, premium stainless steel appliances with gas cooking and “clear ice” icemakers. Master suites will include two large walk-in closets, whirlpool tub for two, double sink with makeup vanity, shower room for two with bench and dual showerheads, and a private water closet. Unlike most developers, Freeman does the little things that make a big difference such as adding insulation above the sheetrock ceilings and around the waste pipes which provides for “ super quiet” interiors. Additionally, a host of pre-construction options will be available, allowing one to customize a home to their own personal tastes. 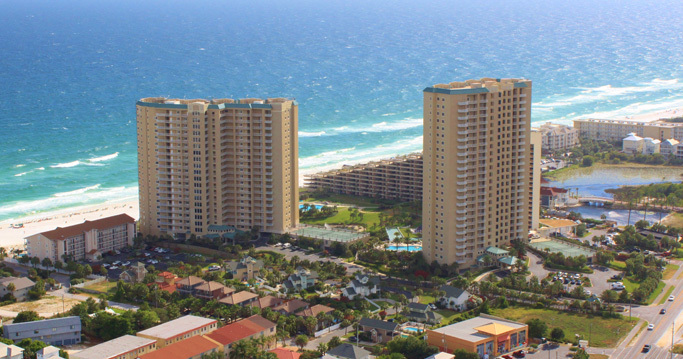 Grand Dunes sits nestled within a 7 acre, lushly landscaped idyllic beach setting. The approach will be through its secured-gated entranceway leading to the stately Porte Cochere building entrance. Once inside, the exquisitely decorated Grand Lobby will overlook our majestic free form pools connected by a breathtaking waterfall with the Gulf of Mexico as a backdrop. Inside the lobby, guests will enjoy the informal bar and seating area, billiard room, pool-front exercise room outfitted with the latest equipment, owner’s conference room and two guest suites that will accommodate overflow guests on those special occasions.